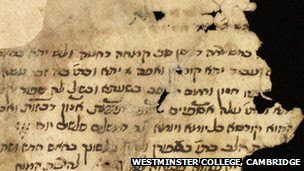 Evangelical Textual Criticism: GBP 1.200.000, anyone? After selling the Codex Climaci Rescriptus some time back, Westminster College in Cambridge continues to sell off the silverware. Again the historic donations of the Lewis sisters are sacrificed to the noble cause. In this article on the BBC New website the reason for sale is that the theological college "did not have the resources to conserve and research them or to make them more widely available" (PMH has a bit of personal experience). No doubt this is true, it just happens to coincide with a major fundraising campaign by the College. Since the Cambridge and Oxford Universities are interested and have apparently started a public campaign to buy this collection (Cambridge Library has a large part of the Cairo Genizah), I suggest some means of supporting this initiative. The administrators of this blog might donate half of the advertising revenue, Peter Head might be persuaded to part with the prize money from his indoor rowing competitions, the Faculty of Divinity in Cambridge could teach for free for a month, and Tyndale House might sell its valuable collection of Marxist and Feminist Biblical interpretation. Seeing such sale happen raises mixed feelings. On one hand it doesn't betray a strong respect to one's cultural and material heritage on Westminster College's part, on the other hand if someone is prepared to pay this sort of money and you need it, why not? In the end they are simple scraps of parchment that are not particularly useful for the purpose for which Westminster College exists. And there is a little bit of envy on my part. Stuff we study is sold for prices many times our annual salary.